We’ve noticed something about you: you’ve changed. Over the last few years, while promoting IT maturity and providing CIO consulting services to associations, we’ve seen the role of the association CIO (or IT leader) change. This isn’t just happening in associations and nonprofits. 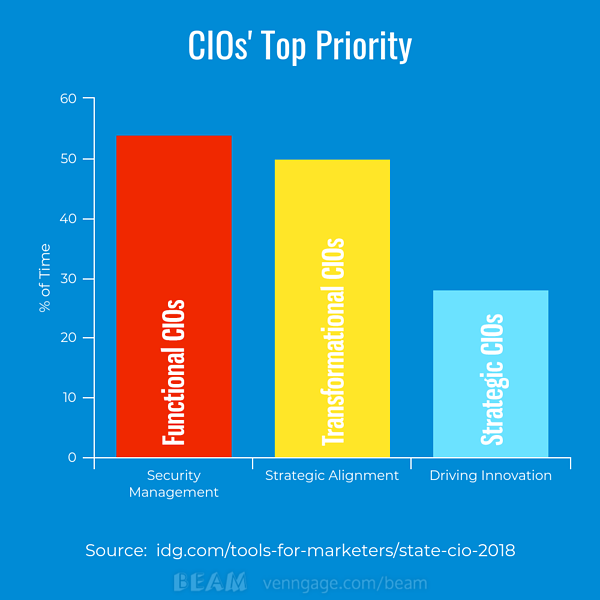 CIO.com’s 2018 State of the CIO Survey came to the same conclusion. CIO.com surveyed business department leaders, in addition to IT leaders, so they could show how the perception of the CIO role is changing across the organization (not just in the mirror). Let’s look at the state of the CIO with a focus on the more relevant findings for the association CIO or IT leader. CIOs across industries are increasing their focus on implementing digital transformation. 88% of CIO.com’s IT leader survey respondents view their role as more digital- and innovation-focused than ever before. They have to be: CEOs are asking them to lead digital business initiatives, help their organizations reach revenue growth goals, and increase cybersecurity protections. Sound familiar? CIOs were asked to identify themselves as strategic, transformational, or functional. Strategic and transformational CIOs are more likely to embrace digital transformation. Yet even IT leaders who identified as functional CIOs report spending more time and energy on digital business efforts. With a hefty portion of digital transformation responsibilities on their plate, 73% of IT leaders say it’s challenging to find the balance between innovation and operations. Functional CIOs struggle more with this challenge than transformational and strategic CIOs. CEOs believe their CIO’s top priority should be upgrading IT and data security to avoid cyberattacks. Not surprisingly, when asked how they spend most of their time, IT leaders ranked security management first. 54% of functional CIOs say security strategy is an integral part of their overall IT strategy and roadmap. Yet survey participants continue to split their time between operational activities related to security management, improving IT operations, and cost control. They must also find time for higher-level work in areas like cultivating the IT/business partnership, implementing new systems and architecture, and leading change efforts. Finding the right operational/strategic balance would be easier if they outsourced some of those security and operational responsibilities. CIOs are increasingly more involved in strategic discussions. 47% of IT leaders report to the CEO and 67% of them communicate regularly with the board of directors. CIO.com learned that IT teams are moving from a project mindset to a product mindset. As IT staff in associations work more with departmental “product” or business teams, they can better understand member/donor needs, preferences, and online behavior—and show colleagues how to leverage technology to deliver products and services to members and customers. Collaboration between IT leaders and business department leaders continues to increase across industries. The survey found stronger cooperation and better alignment between IT and business departments, especially as digital transformation initiatives heat up. 71% of CIOs said they were engaging more frequently in collaborative projects with business departments. Organizations with strategic and transformational CIOs report a greater number of collaborative projects compared to organizations with functional CIOs. 87% of IT leaders expect their business department colleagues will increasingly rely on them as trusted advisors. These CIO consulting services will help business departments navigate technologies, processes, and methodologies as organizations move ahead with digital transformation. Do business departments see their IT counterparts in the same light? Yes—80% of business department heads describe their IT colleagues as strategic advisors or consultants, up from 63% last year. Concurrently, the number of business department leaders who think of IT as roadblocks, risk assessors, or rogue players went down. 73% of CIOs recommend technology solutions. 61% help business departments build business cases for new technology. 61% help develop technical requirements for new technology. They may not have admitted it yet, but your association or nonprofit’s business departments need your help with these advisory CIO services. If your IT department doesn’t have the expertise or bandwidth to take on these roles, consider supplementing your team with CIO support services to provide this type of assistance to your colleagues. CIO.com found that soft skills are in demand for IT leaders. For example, organizations seek IT leaders who are good communicators. Meanwhile, 59% of IT leaders expect to experience critical IT skills shortages over the next year. 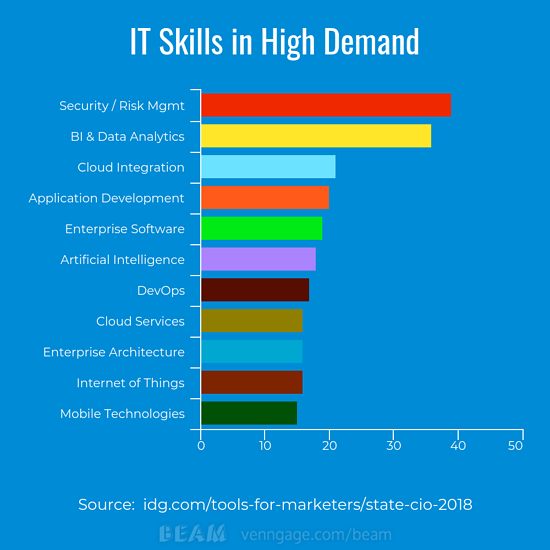 They say security and risk management skills are most in demand and difficult to find, followed closely by business intelligence and data analytics skills. 70% of IT leaders believe any changes in their role will be dictated by their company’s culture—how collaborative, how receptive to change, and how welcoming the organization is to IT’s seat at the planning table. Regardless of size or mission, every association and nonprofit needs someone who’s thinking and acting like a CIO. Their title is unimportant, but their role is critical to leading the organization through digital transformation.